In 2018 Bayside Council was awarded the Keep Australia Beautiful NSW Sustainable Cities Circular Economy Award for Council’s new Waste Avoidance and Resource Recovery (WARR) Strategy 2030: The Journey to a Circular Economy. This leading strategic vision underpins the manner in which Council manages Waste Services in our Local Government Area and sets an aspirational target of diverting a minimum of 85% of all waste from landfill, with emerging technologies and resources permitting, by 2030. Council was acknowledged as a top four finalist for the ‘Overall Keep Australia Beautiful NSW Sustainable Cities Award’ from forty-one NSW metropolitan Councils. What a great achievement for the youngest NSW amalgamated Council! Council’s new Waste Services App was awarded the Sustainable Project Award – Highly Commended at the same ceremony. The App provides the Community with information and online reporting at their fingertips about recycling, garbage, organics, clean-up, community drop off events, as well as requests. The concept of a ‘waste hierarchy’ is enshrined in most modern waste management policies and strategies. The hierarchy identifies the preferred approach to waste management, with avoidance and reduction of waste being the most preferable option, and disposal the least preferable. Whilst waste avoidance is most preferable, it is also one of the most difficult areas for Council to control. Significant improvements at the ‘top’ of the waste hierarchy require individuals and families to act as community waste management champions at a household-level. These actions will be supported by Council providing avoidance and re-use opportunities, and effective community education. Council has more control over the lower portion of the hierarchy, through the choice of bin systems and technologies used to process materials. However, individuals have a large influence on how effective those systems are, especially in terms of using the bin systems correctly. Council will provide education to ensure that residents have the required information and knowledge to use the systems correctly. Council has modified and extended the ‘waste hierarchy’, positioning the community at the centre. Through responsible citizenship and Council leadership, waste materials are returned to the community through initiatives and innovation, striving for a circular economy. The circular model is easily identified as a 7R Strategy. 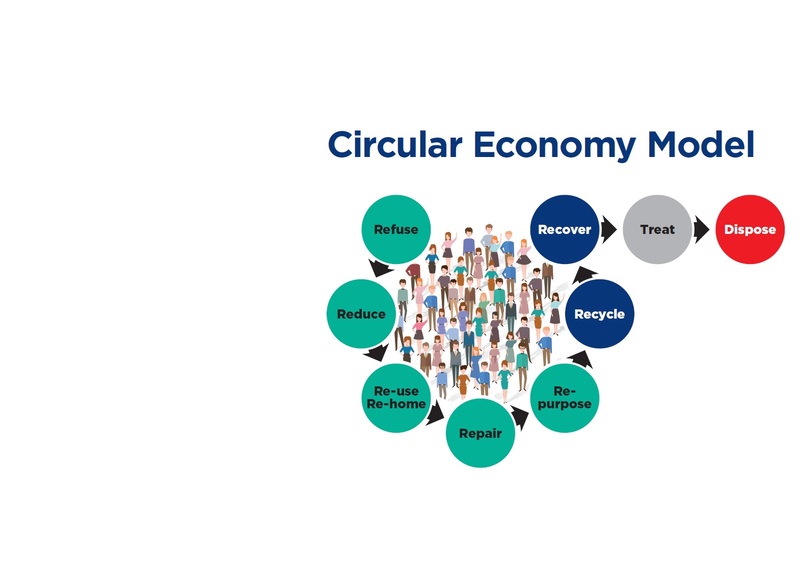 When the 7R circular economy model has been applied, any materials not suitable for recovery can be treated to reduce its environmental impact (e.g. medical waste) and/or disposed to landfill. What Happens to Items at Bayside's Community Recycling Drop Off Events? The following items were dropped off by the community so far in 2019, which were then separated by Council staff to be collected by or sent to the appropriate re-use, recycling and/or recovery organisation. Recycling Drop Off Data for 2019, as of 6 April 2019. Approximately 85 - 95% of this material will be diverted from landfill. For a general understanding on multiple recycling techniques please feel free to view the videos below. To view the nine videos, please click playlist icon at the top left of video. In 2017/18 Bayside Council partnered with Keep Australia Beautiful NSW and offered all primary schools within our Local Government Area with waste education modules. A total of 3,024 students participated in the ‘In the Bin’ and ‘Litter’ modules in 13 schools, to over 100 classes, over 23 days, raising awareness of the impacts of litter and waste related solutions. The Bower’s ‘Tricks of the Trade’ workshop series are a great opportunity to familiarise yourself with the latest ideas and techniques for the repairing and up-cycling of pre-loved furniture. No prior skills are required as experienced facilitators will guide you through the workshop. The Bower’s in-house repairers have been repairing electronic appliances and furniture for 10 years and want to share their expertise with the community. Bayside is offering the first residents that book, a FREE WORKSHOP in 2019. Limited seats are available for residents by booking online via www.eventbrite.com.au. These bookings will be made available throughout the year online and advertised on Council’s Facebook page. Did You Know... You can make money from beverage containers? Have the original label intact. Plain milk (or milk substitutes). 1 litre or more of: flavoured milk, pure juice, wine and water casks. Wine and spirits in glass containers. Wine sachets of 250-millilitres or more. Cordials and concentrated fruit/vegetable juices. Home composting is a great option for avid gardeners. You can turn your leftover food and garden waste into organic fertiliser for your garden. The compost will help keep moisture in your soil and suppress weed growth. Anything that was once part of a plant can be composted in a compost bin. This includes, but is not limited to all your vegetable scraps (cooked or raw), tea leaves, coffee grounds, hair (human or animal), vacuum cleaner dust, shredded paper, and potting mix. Mix as many of these items together as you can find and keep the whole lot moist and aerated. This will give the best results. It will take up to 10 weeks to produce good compost. in garden soil and suppress weed growth. recycling, compost and/or worm farm course. Where can I buy Compost Bin or Worm Farm? You can buy your compost bin and worm farm from: Bayside Garden Centre, 1 Beach Street, Kogarah, phone (02) 9553 7346.